Received a winmail.dat file but can't open it? Cisdem WinmailReader is the one-stop solution for you to open winmail.dat files on the Mac OS, and allows any attachments contained in them to be previewed and saved. It can help you to open winmail.dat files that not even Apple Mail can recognize, and can preview or save the documents attached. You can double-click to open winmail.dat files and check the message and the attachments, or you can drag-and-drop to check single or multiple files at the same time. You can even use QuickLook to preview the attachments. Display All: Show all contents of winmail.dat, including email message and attachments . "This app does exactly what I wanted. On rare occasions, I get a winmail.dat file attached to e-mail from a PC user. 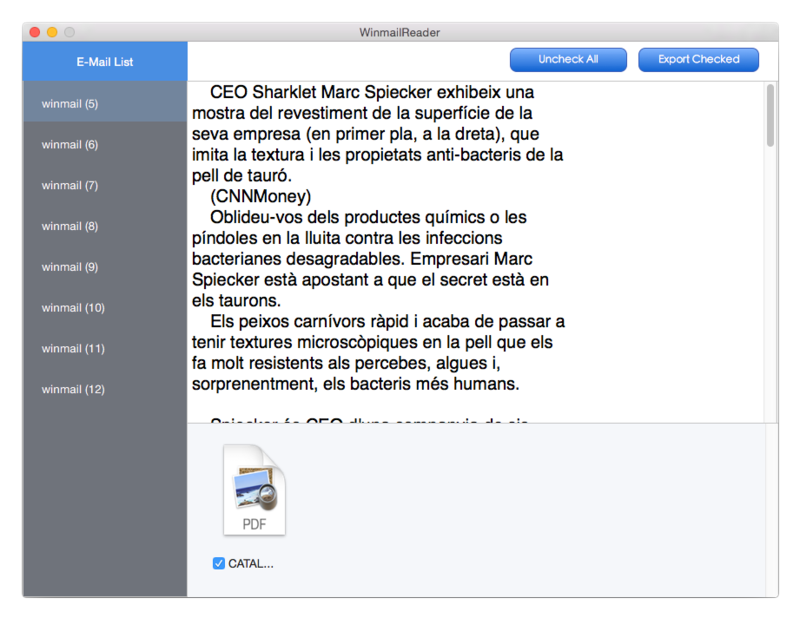 I save the attachment to my desktop, open it with this application, and boom….The winmail.dat file is opened and you’ll see all the content such as pictures, PDFs, text files, etc." I can finally open client files! - OS X 10.8 Mountain Lion, OS X 10.9 Mavericks, OS X 10.10 Yosemite, and OS X 10.11 El Capitan. Same here – registration number not valid. We are really sorry for the mistake. And we have already send the new register code to you via Email, please check your inbox. And any other assist needed could contact Cisdem Support team: support@cisdem.com at any time. Thanks for the quick resolution of the registration code issue.